The term “picting” is new to me but it makes sense. In a recent piece at The Journal by Cathie Norris and Elliot Soloway entitled Picting, Not Wriing, is the Literacy of Today’s Youth, the question of whether the visual nature of literacy in the (literal) hands of youth — mostly via cameras on mobile devices — has overtaken the written literacies. I look at my own teenage sons, and my own adolescent students, and I pay attention to the ways they use Snapchat and YouTube and who knows what other apps to document their world, but are they telling stories? It’s more like the visual elements of their mobile lives are connector points, or documentation hubs of their identity (or projected identities), than telling whatever we want to call a story. Read the comments at the article, and you’ll see a discussion about “story” unfolding along this query. The authors cite research that does back up, however, how young people are more apt to “compose” with images – and use writing only as secondary literacy points — than the other way around. Unless they are in school. Then, the equation flip flops. In school, writing is the key literacy skill and visuals are often add-ons. I think that is generally true (that we value textual writing over visual composition), and while more of a balance would make sense, I still think the teaching of writing and of composition and of “composing” with media is a key anchor of learning in our schools. Whether young people are taking and sharing images with intentional design and composition strategies can probably be debated. I believe that young people still need to learn and to use those more traditional skills (ie, writing with text) to inform the way they interact and write into the world, whether that writing be visual or not. Note the image I used at the top of the post. The elements of design are becoming more and more important for all of us, so teaching and learning visual literacy makes sense. 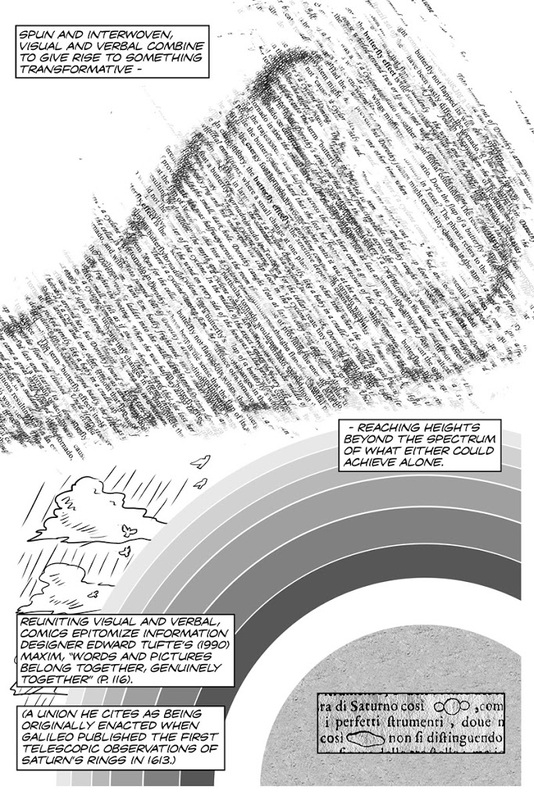 I was reminded of the work that Nick Sousanis is doing around the visual narrative. You can read his piece from Digital Writing Month, in which he explores elements of visual narrative with a unique insight. And I was reminded, too, of the way my friend Kim Douillard, a writing project colleague, sees the world through her camera, and shares out visual themes for others to try across many social media streams, every single week. Kim views what she sees through her camera as narrative points, and understands how a picture can be composed. I try to learn from her. Not everything we write is story, although a common definition of ‘story’ is often debated in writing and teaching circles. Still, the idea that narrative does run beneath all that writers do is an interesting concept, for sure. See Minds Made for Stories by Thomas Newkirk for more on this. Writing with text is important. 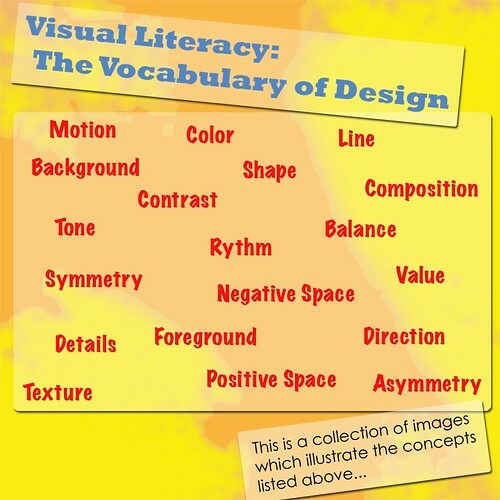 So is visual literacy. Also, add in the ability to speak and listen. Explaining something with video? Yep. That, too. The best approach for us educators is always to find ways to fuse these elements together when working with young “composers” of media. We should teach students how each (writing, visual, audio) on its own transforms a message (if not tells a story) and how each can work in tandem with the other to make a more powerful statement on the world. It is intriguing how visual the world of young people has become and there are many ways to tap into that (graphic novels, comics, infographics, etc). I still maintain, along with others, that the art of writing is still at the center of all these literacies. This entry was posted in comics, Digiwrimo, Making Learning Connected MOOC, Technology Resources. Bookmark the permalink. Interesting struggle here between the primacy of text or images–in schools. There is no struggle outside of school for our students even for myself. I think that schools are turning themselves into islands of irrelevance as they largely fail to acknowledge the expanding role of other modes of sharing ideas, stories, thoughts. I am reminded of the Gary Larson cartoon where the cows finally realize with horror that they are actually eating grass. I wonder if schools at every level will finally realize that there are other modes that are clamoring for their day. Antispamicrostic: At the mobile home lot there were three sizes of manufactured housing: single-wide, double-wide, and judo-wide. Who would have thought there was such a growing market for judo instruction and judo-living. I think it is happening, just not at the rate or level we’d hoped would already be happening. Thanks for the article and the links. I’ve been a visual thinker since my days working in retail advertising with Montgomery Ward. You can see how I use visualizations in most of my blog articles and web sites. In the last #digciz Vialogues I recall one speaker talking about how we’re all perpetual “newbies” because of the constant evolution of new communications technologies coming at us via the web and the business innovation community. An education system, including colleges, that has so many people in place who are still learning and teaching with habits they mastered 10, 20 and 30 years ago, is not one designed for rapid change. One of the reasons I’ve championed non-school, volunteer-based programs for so long is that the people involved in these programs come from business and other non-educator background and can try to apply any idea they learn of to help the kids they work with, as long as they are willing to invest the time and talent and dollars needed. As new ideas emerge from educators such as Kevin and some of the folks I’ve met via #clmooc, #etmooc, #dlmooc, etc. and in non-school programs my hope is these influence what others do, since there are so many kids who are not yet exposed to these tools and the many ways they can be used.